Written by David H. Marion – Are you like me and so many other seaplane enthusiasts too a big fan of the Grumman Albatross amphibian flying boat? If so, have you ever been frustrated by the seemingly endless number of different type or model designations that appear to have been used to identify it over the years? Here’s a short primer on that subject that hopefully will help you better understand what you have been looking at and dreaming about for as long as you can remember – that is, if you are just like me. Note that those last aircraft for West Germany and Japan were identified as models “UF-2” (actually a pre-1962 U. S. Navy model designation) because they were ordered and contracted for through the Navy as opposed to directly from Grumman. *Does not refer to or count the later (1979 – 1983) civilian Part 25 Transport Category conversions done primarily for Resorts International and which were identified as model “G-111” aircraft under FAA Type Certificate no. A22SO. **The first batch of ASW conversions for Chile (G-315) were actually refurbishments of earlier G-251 ASW conversions that had been done for the USAF and later were sold to Norway and Greece too. By the same token, there were still other specialized sub-types of many of those basic Albatross model designations. First among those specialized production sub-types were the Anti-Submarine Warfare (ASW) variants noted in Table 1 above, which started rolling off Grumman’s production line in May 1961. The U. S. Navy for example also operated a multi-engine seaplane trainer variant of the short-wing UF-1 / HU-16C that they designated as UF-1T before 1962 and then re-designated as TU-16C after 1962. Similarly, the Navy’s specially winterized and structurally reinforced variants for “Arctic” operations were designated as models UF-1L before 1962 and as models LU-16C after 1962. These “winterized” or “Arctic” versions of the Albatross in Navy service were different than and separate from the earlier “Triphibian” variants developed for the USAF. The “Triphibian” conversion was a kit that was developed as early as 1953 to allow Air Force Albatrosses to land not only on runways and water but directly on packed snow or ice too. It consisted of a reinforced main hull keel and hydraulically extendable, 12 inch by 15 foot skid attached below the main hull keel, along with small, bolt-on outrigger skids attached to the front of each balance float. Eventually the mounting tube for the outrigger skids that was built into the balance floats became a universal feature of all subsequent production floats. However, because the “Triphibian” was not an actual production variant and any Albatross could be so converted using the kit, it did not have its own unique model identification. One factor that should have simplified the identification process over the years is the fact that after 1962, all of the pre-1962 model designations were technically-speaking no longer still valid for use; they were all officially replaced with the newer “HU” series designations – at least in regard to aircraft still in U. S. military service. However, the same did not necessarily apply to aircraft operated by foreign countries or military services. Take for example the last Albatross ever built – Grumman serial no. G-464 which was built in 1961 as a long-wing model UF-2, USN Bu. no. 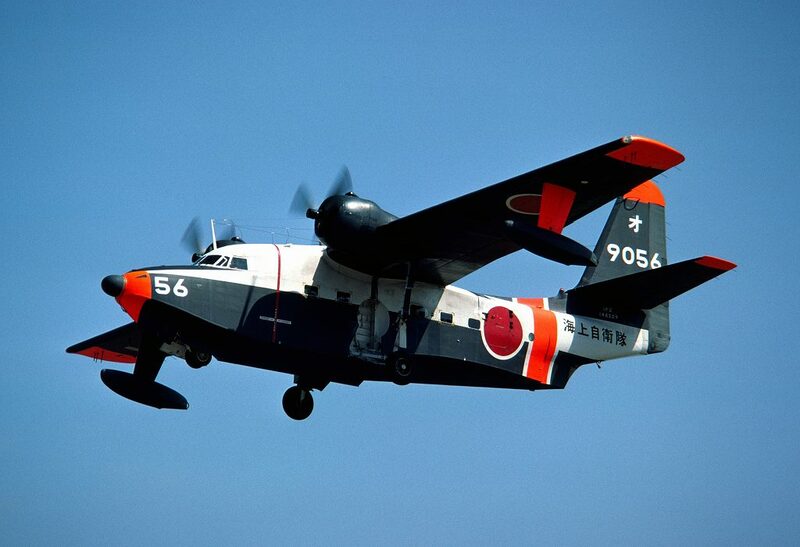 148329, which was subsequently identified by its first owner, the JMSDF, using the serial or “buzz” number 9056. I have seen at least one photo of it on the Internet that were supposedly taken in 1976 (not long before Grumman bought it back and converted or rebuilt it into a “new” civilian model G-111) but in which it was incorrectly identified it as an HU-16D. If it had been in U. S. Navy service, that would have been correct, but it was not. In fact, in the photos in question, you can actually discern that it was still identified by the JMSDF at that time as a model UF-2 because that model designation was still stenciled on its tail. As noted previously, the Grumman design no. G-64, original, short-wing variant of the Albatross never received independent civilian certification as such. Most surplus military “warbird” examples of the Grumman Albatross have been approved for civilian use over the years under a variety of “Restricted” category type certificates including nos. A33SO, A2GL, and A23NM, each of which was awarded to private, civilian owners of Albatross aircraft after they were able to satisfy the requirements of 14 CFR §21.27. Only a very few Albatrosses have ever been converted and approved for commercial civil operations with Standard certificates of airworthiness in accordance with the Transport category standards of FAR Part 25 in accordance with TC no. A22SO. In fact, in spite of plans to rebuild many more of them, only 13 examples of the Albatross, all of which were already long-wing variants of one sort or another, were so converted – and because of an essentially random decision made at the time, they were designated as Grumman models G-111, perhaps in tribute to the first long-wing conversions done for the USAF. Are you still confused by all of that? Don’t feel bad; even the FAA has not demonstrated much ability to keep straight all of the various model designations used for the Grumman Albatross either. Next time around, I will cover the one truly unique variant of the Albatross – N44RD, a custom, essentially “homemade” long-wing conversion of a former Navy HU-16C that was built and certified independently by its former owner, Mr. Reid Dennis. The FAA ended up calling it a model HU-16RD. In one sense, it is the exception that proves all of the other rules applicable to Albatross identification.